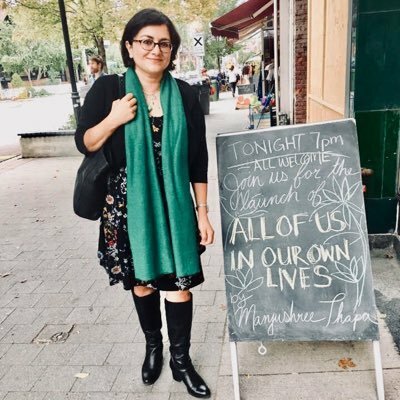 Born in Kathmandu, and having lived in many countries, Manjushree Thapa is now a Canadian novelist, essayist, and editor. Her novel All of Us in Our Lives, published in Canada by Freehand Books and in India by Aleph Book Company, was launched last month in Toronto. In an interview, Manjushree says her writing has always been rooted in Nepal, "and will continue to be." You’ve been a Canadian for a fairly long time, but only now have published a novel in Canada. Is the prolonged delay because of an unwillingness to adapt and accept your new Canadian identity? I moved to Canada from Nepal in 2008, mid-career, with several published books, and a novel in its final stages, Seasons of Flight. It took a few years to see that novel through to publication. Then I began All of Us in Our Own Lives. I finished its first draft at the Writers’ Trust residency at Pierre Berton’s house in Dawson City, the Yukon, in the winter of 2011. It’s taken this long for it to be completed and published. I think it took me this long because it’s the first book I wrote about Nepal from afar. I wasn’t quite sure how to do that. And the Canadian literary world maybe didn’t know what to do with a writer like me, who migrated to Canada fully formed. My writing has always been rooted in Nepal, and will continue to be. I was fortunate to receive a grant from the Canada Council for the Arts for it, even though none of my earlier writing had been published here. I suppose that’s why it’s particularly meaningful to me that All Of Us in Our Own Lives found a home with Freehand Books. This is the first time I feel like I may be related, in some way, to the world of Canadian literature. To be honest, I didn’t quite feel Canadian till I became a citizen in 2016. Before that, as a permanent resident, I took an interest, of course, in my milieu. I’d read many Canadian authors before moving here, but didn’t know much about the intricacies of the Canadian literary world – the institutions that shape it, and the writers they produce. It took a few years of reading to get my bearings. I now follow the Canadian literary world’s goings-on, though I do still feel some confusion about being an insider-outsider to it. But then the world of Canadian literature can be quite cliquish and inward looking. I suspect that many writers feel out of place in it as perhaps is fitting, given the revival of Indigenous literature. I’ve learned the most by reading writers such as Eden Robinson, Thomas King, and Lee Maracle. They’ve reframed the entire world of Canadian literature. Perhaps it’s right for all of us to feel a bit like outsiders here. You’re a rare, authentic, grounded feminine voice to have emerged from South Asia and your oeuvre is rich, diverse and eclectic. Is your latest novel All of Us in Our Own Lives your first attempt at what is generally described (often derisively) as immigrant literature? Immigrant literature, if I understand the term, refers to literature about what Salman Rushdie called 'the imaginary homeland’ - the homeland of the immigrant writer’s ancestry, perhaps viewed somewhat nostalgically upon an experience of loss through migration. I started writing as a Nepali writer based in Nepal, and I remain creatively rooted in the contemporary moment. It’s true that I’m an immigrant writer now. But I don’t think this automatically makes the content of my writing immigrant literature. That is a sensibility that I haven’t ever adopted. I am, in fact, decidedly anti-nostalgic. I grew up in Nepal, the US, and Canada, and my family has lived in many other countries - Sri Lanka, the Philippines, Switzerland, India. I was formed by this constant feeling of displacement, and see myself more as a writer of the contemporary global moment. I always try to bring in as much of the world as possible into my work, rather than a duality between my ‘imaginary homeland’ and where I now live. That said, if someone sees me as a writer of immigrant literature, I don’t particularly mind. There’s a lot of confusion around these terms, and I don’t take the term ‘immigrant literature’ as derisive. You’re multilingual and a renowned translator, and yet you prefer English. Why? My family lived in Ottawa when I was just learning to speak. English is my first language, even though Nepali is my mother tongue. I’m far more fluent in English, with a much greater range of expression. I did at one point start to write in Nepali, but quickly realized that it would be a better use of my skills to become a good translator of Nepali literature, rather than a mediocre Nepali writer. A good literary translator a rare thing. It has also led to a deeper engagement with the world of Nepali literature. It’s become my way to pay tribute to Nepal, which has a rich literary scene. Do you see a natural progression in your journey as an author? What are the broad themes that your fiction attempts to help understand? I am what is called an engaged writer, that is, a writer who takes on large social and political themes. I’m interested in novels of ideas and start with concepts that I then flesh out into specific characters’ personal stories. The theme of All Of Us in Our Own Lives is interdependence, as understood in Buddhism: the interdependent nature of the rising and extinguishing of people’s suffering. The world of international aid, and particularly the women’s empowerment industry, became a way to flesh out that concept by having characters whose trajectories would otherwise never intersect come together and spark personal growth and change in one another. My main growth as a writer has to do with aesthetics. When I started out as a writer, I was not always in control of my material. I’d start out meaning to write a picaresque and end up, four years later, with a nineteenth-century novel with some picaresque elements. The form would get away from me, or the characters would. Over the years my writing has grown more controlled. I feel like I now end up writing the books I set out to write. You have produced quality creative nonfiction. Is the process of creating the same with fiction and nonfiction? Those processes are completely different. I love writing nonfiction because it’s straightforward. I conduct the necessary research, and then find the best possible form to illuminate my material. There isn’t the existential angst that comes with fiction-writing. Or maybe I’m less ambitious about my aesthetics in nonfiction. 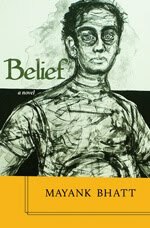 With fiction, I am keenly aware that I have complete creative freedom: I can write anything at all. And so I’m filled with doubt. Why write this when I can be writing something else? What is at stake in the writing of this story? Why have I chosen this character, this style, this tone, this word? What is the right form for this story? And the eternal question - is fiction dead? Every decision is marked by doubt. This makes writing more difficult. Fiction writing feels a thousand times more angst-ridden than nonfiction writing. Yet here I am, launching into a new novel. I can’t seem to stop. Read an excerpt from Manjushree's novel below.